I've listed 1 attraction, posted 36 photos, contributed 2 places, have 72 friends. Ibrahim likes to travel for hiking treking, biking, diving snorkeling, driving, rafting, sailing, camping and wildlife safari! Ibrahim interested in museums, art galleries, archaeology, historical sites and cooking classes! 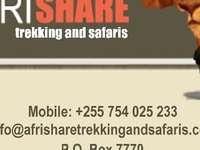 Something about me I run tour company called Afrishare Trekking and safaris Tanzania Eat Africa, we Organize all type of adventures such as Mount Kilimanjaro trekking, safaris to Serengeti, Ngorongoro crater, Lake manyara, Tarangire, Zanzibar beach holidays, cultural etc Travel highlights around my area you can do Mount Kilimanjaro trekking, Safaris to different parks, beach holidays to Zanzibar, Mount Meru trekking, different cultural tourism such as day hike to Kilimanjaro, Lake chala, Masai village excursions, hot springs, cultutral tours, Travelers I enjoy Different counties arround the world. Ways to contact me P.O BOX 7770 Soweto, Moshi, Tanzania. 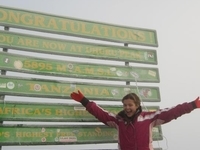 Afrishare organised a 6-day climb to the top of Mt Kilimanjaro for a group of three friends. From the very first email enquiry, we were re-assured by their timely communication, helpful advice for packing, recommendations on the best route to take based on our skill levels. Once on the ground, we were provided with a detailed audit of our trekking gear with advice and guidance from our two guides on how to approach the mountain (pole pole as they say in Swahili). The trip itself was very well organised. The support provided on the trek itself was superb. The guides were extremely knowledgeable and skilled - providing advice, tips, identified birds, animals and plants along the way and shared stories of the history of the mountain and the surrounding countryside. The food was delicious and freshly made - appetisers consisted of popcorn and ginger snaps which was *delightfully* welcome at more than 3000masl. Thank you Ibra for a wonderful experience! 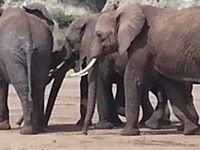 Afrishare organised climbing Kili for our group of three. Every aspect of the 7day climb was very organised. 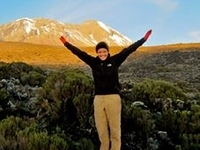 Our guides were highly experienced and knowledgeable of the mountain and it's flora/fauna. Thanks to their expertise, all 3 of us made it to the top for an unforgettable view. The food was superb, especially considering we were on a mountain. Dishes served included: fish fillet, roast potatoes, spaghetti bolognaise and chicken. The chicken was of a particularly high standard; high quality cuts of fillet. Fresh fruit was in abundance, in addition to copious amounts of vegetables. Hot chocolate, tea, coffee, popcorn and cookies awaited us at every lunch/dinner stop. Huge thanks to Cosmas the chef. The rest of our crew were also marvelous; extremely friendly and helpful. 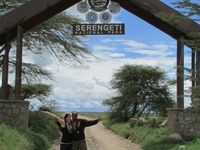 Ibrahim did an excellent job of managing our trip and we look forward to working with him again.